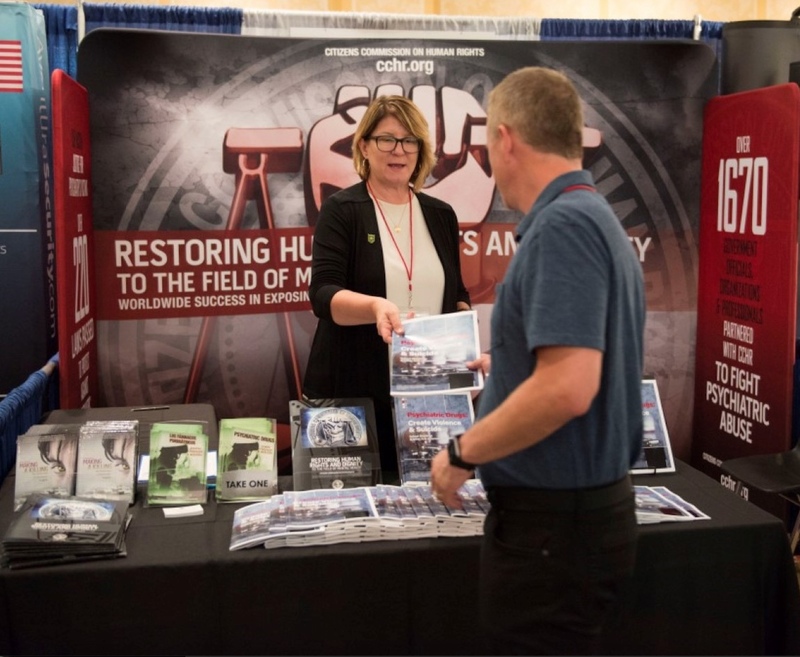 The Florida chapter of the Citizens Commission on Human Rights (CCHR), a non-profit mental health watchdog dedicated to investigating and exposing abusive psychiatric practices in the mental health industry, educated hundreds of school officials, security professionals, School Resource Officers and members of law enforcement during the 13th Annual National School Safety Conference & Exposition on the correlation between mass murder, violent crime, suicide and psychiatric drugs. Advertised as the largest and most comprehensive conference covering all the aspects of school safety and security, the National School Safety Conference attracted more than 900 attendees and 100 exhibitors from across the country all focused on improving school security measures. These security measures ranged from facial recognition technology to portable scanners and sessions on how to respond to an active shooter but one exhibitor was there with a different message the undeniable connection between school shootings and psychiatric drugs. For the past 20 years, CCHR has been investigating and exposing the interrelationship between mass murder, violent crime, suicide and psychiatric drugs. During this time CCHR has reported that those taking or withdrawing from psychiatric drugs have committed at least 36 school shootings and/or school-related acts of violence. This correlation is not surprising when you consider that prescribed psychiatric drugs, such as antidepressants, antipsychotics, stimulants, and anti-anxiety drugs, have been documented by 27 international drug regulatory agency warnings, including the U.S. FDA, to cause side effects of mania, hostility, violence, and even homicidal ideation in a percentage of those prescribed. Prompted by the tragic school shootings in Florida and Texas, the international headquarters for CCHR released a compelling 64-page report titled Psychiatric Drugs Create Violence & Suicide: School Shootings & Other Acts of Senseless Violence, which details more than 60 examples of school and mass shootings, stabbings and senseless violent acts committed by those under the influence of psychotropic drugs or experiencing serious withdrawal from them. According to CCHR International, the goal of this report is to help law enforcement; educators and policy makers learn how psychotropic drugs are a hidden link to the prevalence of violence and suicide in the community. An investigation into the connection is long overdue when you take into consideration that between 2004 and 2012 the FDA’s safety information and adverse event reporting program, known as MedWatch, received a staggering 14,773 reports of psychiatric drugs causing violent side effects, including 1,531 cases of homicidal ideation/homicide, 3,287 cases of mania, and 8,219 cases of aggression. For more information on psychiatric drugs and side effects, school shootings, or obtaining educational materials for yourself or an organization, please call 1-800-782-2878.